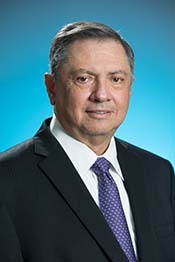 Camilo Soto is the President/CEO of PCNet/Corserva, with more than 40 years of progressive experience in the information technology industry. He has a passion for leadership and vast experience as both an executive and entrepreneur. Camilo has been involved with the HCCMO for over two years and has shown his leadership and compassion on many occasions. One such occasion was during his role as a business delegate for HCCMO's Bilateral Trade Mission Trip to Costa Rica. He possesses a passion for helping others achieve their mission. This quality was made clear as last year he hosted a HCCMO Business After Hours networking event that benefited the Batuta Orchestra in his native Colombia. He has also worked closely with local non-profits organizations in our community, such as the Hope Community Center. His desire to help others has no limits, as Camilo has also provided guidance to the HCCMO with our internal IT server. His compassion and enthusiasm is displayed in everything that he is involved with. We are fortunate to have Camilo as a member of the HCCMO, as he is a valuable business and community partner. If you would like to learn more about Camilo you are welcome to email him.